We really "hit the ground running" today, beginning with the first of what promise to be three wonderful Bible Studies from Isaiah led by the Assistant Bishop of Singapore, Rennis Ponniah. He was introduced by the former Bishop (and Archbishop) Young Ping Chung, who was his chief consecrator. +Young Ping said that when Singaporeans mention "Bishop Ponniah" not everyone knows who they are talking about, but when someone mentions "Bible Teacher Ponniah" everyone knows exactly who they are talking about. Today he explored Isaiah's Vision and Call (which I have preached on dozens of times - and he mentioned several things neither I nor anyone else I spoke to about it had ever noticed.) More than head knowledge, we knew we were in the presence of the Lord. The morning addresses were on the nature of Covenant, by Archbishop John Chew (not the Anglican Covenant, but Covenant as we encounter it in Scripture - and specifically, in Isaiah), followed by a discussion of the "structure" and calling of the Global South fellowship within the Anglican Communion, this by Archbishops Mouneer (the Middle East) and Emanuel Kolini (Rwanda). 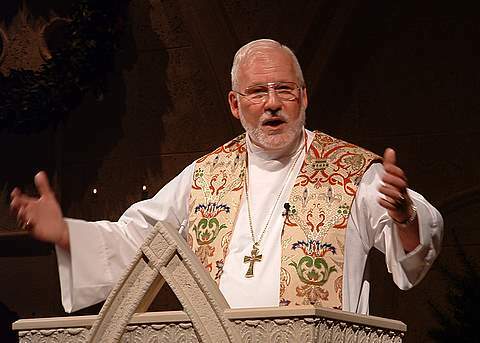 Kolini was devastating in his reprisal of the efforts of the GS Primates to restore TEC and the Anglican Church of Canada to compliance with the "mind of the Communion" regarding human sexuality over the past decade and a half and especially since 2003. Meeting after meeting, resolution after resolution, communique after communique...at a cost of hundreds of thousands of dollars, with no positive results. He said, "we do not need another resolution from this gathering, we need to act in accordance with what we know the Lord has said to us." I am not at all clear about what that means, but I have the sense that there is a weariness on his part and many of the other GS leaders, in waiting for decisive action by the Archbishop of Canterbury. (I mentioned above that the ABC sent a video greeting, which we viewed at the close of the morning session. For the first time in my memory, there was no applause when he finished.) This afternoon I was included (as the "leader" of the Communion Partner "deputation" - consisting of myself and +Mark Lawrence.) in a visit by all the Primates to the Presidential Palace for high tea with the President of Singapore. I would guess the property was about the size of the White House property in DC. The Palace is gorgeous, very colonial in style, and surrounded by a private golf course. (I thought about asking the Diocese to consider acquiring something like it as a retirement residence for the Bishop, but that might be misunderstood by some...) +Peter Ackinola, who has now retired as Archbishop of Nigeria, and who will be stepping down as Chairman of the Global South Steering Committee at the end of this week, said to the President, "We represent about 70% of the world's Anglicans; I might say that we represent the face of the 'new Anglicanism.'" Interesting comment. About 2/3 of the Primates are black or brown. Most are relatively young, and most come from the world's "two-thirds nations." Following dinner the Primates met together and invited all of the "Western Associates" (ACNA, the CP Bishops, Bishops from Australia and New Zealand) to meet with them. The conversation focused almost entirely on ACNA, CP, and TEC. I think tonight's meeting may have been the principal reason I am here. There is (or at least was) much confusion among the GS Primates as to why there are two different groups from North America, both claiming to be orthodox Anglicans (ACNA and CP). While some understood clearly that CP is committed to remaining orthodox and remaining Anglican, they question why ACNA has felt it necessary to leave and start something new. Others, however (and I would guess perhaps a 2/3 majority or more) question why and how we who are part of CP can remain in TEC. And for them the question was: "if we have declared 'impaired' or 'broken' communion with TEC, how can we be 'communion partners' with the Communion Partners?" +Bob Duncan and I did most of the talking, and I think we were both respectful and supportive of each others' positions. I said that over the past many years we have walked a great distance together, beginning with a shared commitment to remain orthodox within TEC. But finally the time came when many who had shared that commitment within the Anglican Communion Network determined that they could NOT remain part of TEC any longer. Those who left have (for the most part) become ACNA. But the Communion Partners continue to hold the original commitment, and we have not been told by TEC to do that which we cannot, or been forbidden to do what we must. I described my (and our) commitment to "be there" for those who wish to remain part of TEC, but equally to "be there" for those who believe they must leave. I think that by the end of the evening there was pretty general agreement that Archbishop Ian Ernest (of the Province of the Indian Ocean) got it right when he wrote to the ABC on April 12: "I feel constrained by my conscience to uphold my duty as shepherd of the flock and to forthwith suspend all communication both verbal and sacramental with both TEC and the ACC - their Primates, bishops and clergy until such time as they reverse their theological innovations, and show a commitment to abide by the decisions of the Lambeth Conference. 5) Seek as strong a partnership with the Global South as is possible. All of this seemed to be to be very well received, PTL. So, does Bishop Howe (as well as ALL CP dioceses) intend to suspend all communications with non-compliant Episcopal Church leadership??? BIshop Howe is not a member of the Global South leadership, he - along with Bishop Lawrence, Bishop Guernsey, and Archbishop Duncan - were guests at the Singapore gathering. He is reporting on the consensus of the Global South partnership. Bishop Howe remains clear that he feels called at this time to work from inside TEC for reform. Isn't it hypocritical to tell one group to suspend all communications when one doesn't intend to do so oneself????? This strategy, if you can call this such, is a non-starter. I believe the Global South are intending to follow-through on what they are calling for - many all ready have. Bishop Howe is reporting on what they said. It seems pretty clear that they've been neither listening nor communicating for quite some time in any case, despite their promises to the contrary. How is this a change? One thing we do know for sure is that the Global South leadership assured the Communion Partners and the ACNA that would remain in communion and fellowship with them, maintaining open lines of communication and shared ministry. What has been clarified here is that they are making a distinction between dioceses who are in the Communion Partnership and dioceses and Bishop Schori and her 815 organization who are not. It is sadly telling that the Global South leadership met Rowan's taped message with silence. That perhaps is what concerns me the most.